I want to love our crock pot. I know families that turn it on in the morning and dinner is ready when they get home. This just isn’t us. Hubby doesn’t like soups or stews very well and we rarely have meat so a roast doesn’t do it for us. 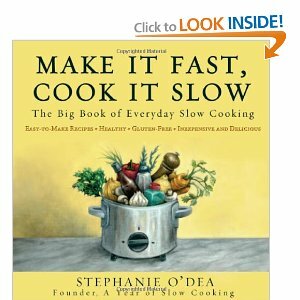 However, in an effort to branch out and make some new meals I checked out Make it Fast, Cook it Slow by Stephanie O’Dea from the library. Marked a number of meals to try. This afternoon I made her recipe for a rotisserie-style chicken and it got two thumbs up from hubby and son. I loved how easy it was and there is plenty left over after dinner for tomorrow night too. Here is the link directly to the recipe so you can try it out, or check out any of her many crock pot options. http://crockpot365.blogspot.com/2008/10/crockpot-rotisserie-style-chicken.html I did stuff the body with onion and garlic which were listed as optional. I had mine of hight for 5 hours and it was falling apart it was so well done and juicy, I think I could have pull it at 4-4.5hrs. I’m excited to try a few more of her meals and fall in love with my crock pot.